Last Thursday I made the first of what I hope to be three deliveries of homemade fleece blankets to the Cooper Cancer Institute. First off let me say that this day would not have been possible without all of your generous donations. I am so thankful for all your help. Thank you all! It was an incredible morning! I was met by Beth Ann Rachkis the Director of Marketing and Communications at Cooper Cancer Institute. 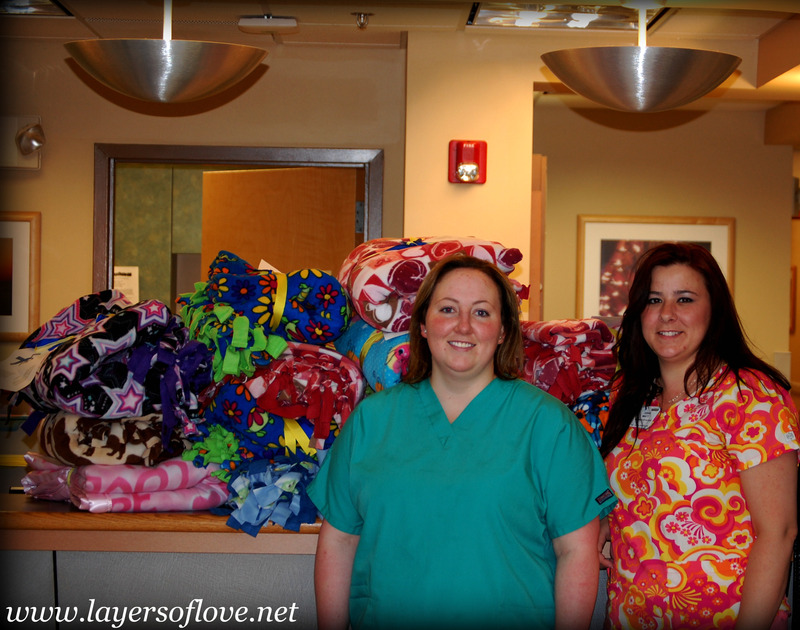 We brought the blankets into the chemotherapy treatment room snapped a few photographs and started handing them out. It was fun to see which blankets were chosen by the patients. We had so many different patterns to choose from. Not only was it wonderful to bring so many smiles to the chemotherapy patients but it was equally as wonderful to chat with them for a little while. Many who chose blankets put them to use right away as they were receiving their treatment that morning. Comfort and warmth, plus a smile, what a great combination. I will never forget delivering the blankets last Thursday. It was a moving day and though I have left the building the memories I made that day have not left my mind. So what is next? Now the drive continues, hopefully we will gain more exposure from our website and our facebook page. With that exposure we hope to bring more donations in for our cause. Our goal is 74 blankets and we are over 1/3 of the way there already. Thank you to everyone who has joined our cause and provided comfort and warmth to those chemotherapy patients who are currently undergoing treatment. We could not have done this without YOUR help. This entry was posted in Donations, Uncategorized and tagged cancer, chemotherapy, comfort, Cooper Cancer Institute, delivery, fleece blankets, giving, grateful, help, nurses, thank you, warmth. Bookmark the permalink.